Recently my family and I were standing in a long line at Target. Since I was wearing a Star Wars Weekends T-shirt (which is not at all uncommon) the woman in front of us asked me if we had gone this year. We struck up a nice conversation. During it she told us that she works at Pizza Planet and how much she enjoys her job. Talking with her was a nice way to pass the time while we waited. A few days later my daughter and I were at Disney’s Hollywood Studios. We caught the last Light, Motors, Action! performance, rode Star Tours, and then decided that we wanted to grab something for dinner. Remembering how nice the cast member at Target was, we decided to try Pizza Planet. It was one of those places we said we would try someday but never had. It was still a little early for most people to eat dinner, so the restaurant was not crowded. The cast member who took our order had a big smile on her face. She wasn’t bothered by the questions that we asked and answered them cheerfully. She didn’t seem like she was pretending that she liked her job, I truly believe that she loved working there. I was sure that would be the end of the friendly Pizza Planet cast members but I was wrong. The young man who gave us our order had a smile as well. He had a huge, friendly personality. Once again, he seemed to be thrilled to be working there. As we went upstairs to grab a table my daughter and I both remarked on how great everyone was. I have seen some wonderful people working in the Walt Disney World restaurants, but the Pizza Planet cast members that we’ve encountered were probably the friendliest. 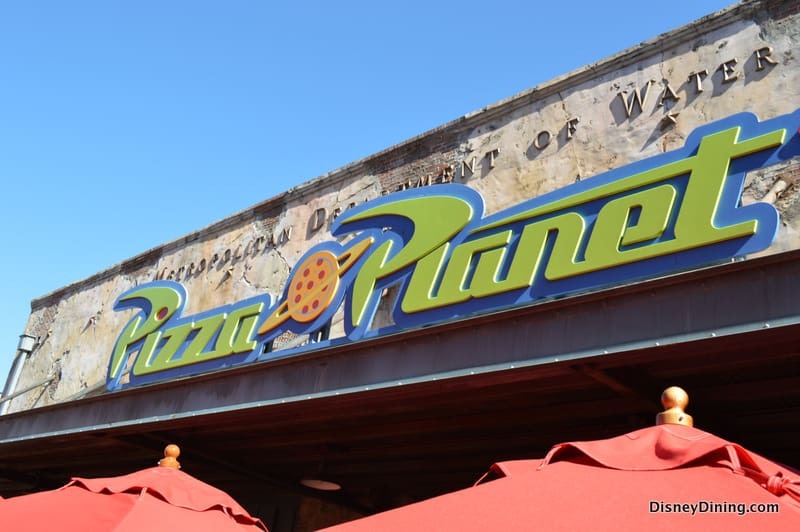 The food at Pizza Planet is mediocre at best. We knew that going into the restaurant and we got what we expected. Will we return to Pizza Planet again? Quite possibly. The cast members that we encountered made a huge impression on us, which makes it a great place for us to eat.